Conclusion. Who can enrol in kindergarten and/or in a welcoming class? 1A recent study on childhood conditions in the Brussels Region underlined the population increase and questioned their impact on early childhood in a region where social, economic and cultural polarisation is pronounced (DUSSART and MOTTINT, 2007). The question which is dealt with in this article concerns the extent to which this context affects the equality of access to kindergarten. It is based on the principle that the opportunity to attend kindergarten must be guaranteed by the availability and accessibility of services and cannot be influenced by characteristics related to the child or his or her family. 2In Belgium, this level of education is the main means of entry into the education system. It is a level in its own right which – together with primary education – makes up basic education. It is considered to be a necessary level for learning basic skills; it is free and open to all from the age of 2 ½, but is not compulsory. In Europe, Belgium is in a leading position with one of the highest enrolment rates (Eurydice, 2009). The European objectives established in Barcelona in 2002 to reach an attendance rate of 90% by 2010 for children over the age of 3 have been exceeded for many years in Belgium (UNICEF, 2008). These high rates are the result of a huge demand for pre-school education and its widespread availability. The subsidy scheme which allows the supply to be adapted to the demand by basing itself on the number of children enrolled greatly contributes to this. It applies to basic education as a whole and does not consider the fact that kindergarten is not part of compulsory education. 3This study goes deeper into the impact of the demographic context in Brussels on the access to kindergarten (IBSA, 2010). It examines the question as to whether the sudden lack of availability can have a negative impact on the equality of access to school. This question is in keeping with the manifesto “Pauvreté et école, quelles priorités?” of the Délégué général aux droits de l’enfant.1 In order to answer it, one may turn to the experience acquired with nurseries and child care, where the lack of availability is widespread. In this context, apart from the fact that the needs of part of the population are not being met, there is also social inequality in terms of access to existing services. Generally, despite equal needs, the use of child care services is less frequent in the least privileged families. This is due to individual factors regarding the demand, as well as to contextual factors concerning the characteristics of the services offered and the management of schools. 4At individual level, attention is drawn to the fact that, more often, the most privileged families choose the best services from a qualitative point of view and use them in circumstances which are often more favourable to the child (HUSTON et al., 2002). The process involved is more pronounced when there is a lack of availability, due to the fact that families with a higher education level are better informed of availability problems and are likely to put their children on waiting lists on time (MAHIEU, 2005). 5From a contextual point of view, the provision of services plays a selective role. It has been shown that, in Brussels, families with a low education level and immigrant families are victims of unintentional selection, partially due to the low availability of public services in their neighbourhoods and to the eligibility criteria favouring families in which both parents work (VANDENBROECK et al., 2008). In one study conducted in Brussels, the use of waiting lists for nurseries had an impact in terms of social selection (LORANT, 1996a, b). It has also been shown that, in Belgium, the social inequalities related to use are more pronounced when there is a low level of availability in the municipality of residence than when it is higher (FARFAN-PORTET, 2010). 6What are the social consequences of a lack of availability in pre-primary education? This question is all the more crucial when the social and economic inequalities which affect the children in the region are serious and when the mother tongue of a significant part of the population is neither French nor Dutch (JANSSENS, 2008). In order to answer it, we shall begin by describing the situation based on regional and municipal indicators related to supply and demand. We shall then explore the question of equal access by analysing the mechanisms which underlie enrolment in schools when the stakeholders on the ground observe a lack of availability. We shall also consider it in connection with the early childhood sector. 7In the Brussels Region, the French and Flemish Communities manage their education systems separately. The result is that certain organisational characteristics may differ such as the level of support and financing (JANSSENS et al., 2009). The constitutional principles of freedom of education and freedom of choice allow families to choose their child’s school. For the Brussels population, the education market is complex: in addition to the two distinct education systems are their networks as well as 19 independent municipalities. 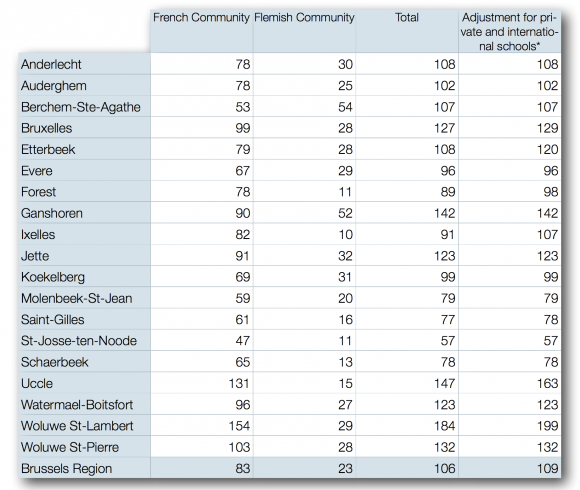 In terms of “market share”, approximately 80% of the total number of pupils in pre-primary education are enrolled in French Community schools, with the remaining 20% in Flemish Community schools, not to mention the private schools and four European schools. 8The demographic context of the region is marked by an increase in fertility rates, birth rates and the emigration of elderly people (Federal Planning Bureau, 2008). The region also stands out due to the fact that a significant number of births are not registered with the National Registry: these include the newborn babies of asylum seekers or of illegal residents. In 2007, 1 456 births were the object of a report by the Brussels Region health services without being registered with the National Registry (OSS, 2010). 9According to the perspectives of the planning bureau for the 2007‑2060 period, the number of births will continue to increase, reaching a peak in 2023. As the birth rate began to increase around 1995, we shall use 1995 as a reference for comparisons over time. The increase in the number of births since 1995 varies according to municipality : it is most pronounced in Anderlecht, Brussels City, Molenbeek and Schaerbeek. 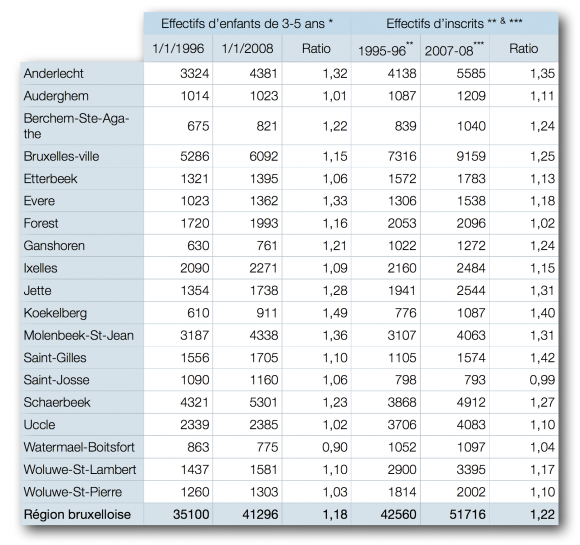 This is also the case in other smaller entities such as Evere, Ganshoren, Ixelles, Jette, Koekelberg and Saint-Gilles, while the birth rate figures have remained stable throughout the period in Uccle or Woluwe St Pierre for example, and have decreased in Watermael-Boitsfort (HUMBLET, 2010). 10The number of pupils in the age group of school-age children increases at the same rate (Table 1). Between 1 January 1996 and 2008 the population of children aged 3 to 5 increased by 18%. This increase affects large municipalities such as Molenbeek (+36%) and other small municipalities such as Koekelberg (+49%), but growth was almost non-existent or slightly negative in Auderghem, Uccle, Watermael-Boitsfort and Woluwe St Pierre (Table 1). 11Between the 1995‑96 and 2007‑08 academic years,2, the number of pupils enrolled in French and Flemish Community kindergartens increased by 22%. In total, there were 9 156 additional children in kindergarten classes during the period, half of whom were in Anderlecht, Brussels City, Molenbeek and Schaerbeek. The French Community foresees an additional increase of close to 10 000 kindergarten pupils in Brussels between 2009 and 2022 (Prof, 2010). 12The challenge is significant. In the case of Molenbeek, for example, the population increase of 27% is higher than that of the region and applies to a higher number of children. Thus, 956 additional children were enrolled in kindergarten between 1995‑96 and 2007‑08, which corresponds to 44 classes if we consider the average class size to include 21.7 children (see below). 13Until now, the challenge involved in accommodating a growing number of children has been met by the school systems and has even resulted in an increase in the number of children provided with schooling. How has this happened? In French Community schools, it has mainly involved the creation of new classes (292 new classes between 2000‑01 and 2007‑08) and a slight increase in the average number of children per class (from 21.2 to 21.7 children). In the Flemish Community education system, four new schools have been created. We have not had access to the information concerning the number of classes. Beyond these quantitative indications, the questions remain as to where and in what conditions these new classes have been created. 14What is the importance given to pre-primary education by the population? The indicator which is usually used to measure participation at a level of education is an enrolment rate: this involves comparing the number of children enrolled with the total number of children in the age group of the level of education being analysed. Let us mention that the data for calculating it are insufficient, which constitutes a significant obstacle as regards evaluation. In the numerator, the official enrolment data do not concern children in private and international schools and, in the denominator, the children of asylum seekers or illegal residents in the region are not included in the official demographic statistics even though they have access to education. 15We have worked according to age groups and have calculated the gross enrolment rate of children aged 2 ½3 to under 6 by differentiating two indicators: the gross pre-primary enrolment rate according to the municipality of the school (GPERschool) and the gross pre-primary enrolment rate according to the child’s municipality of residence (GPERchild). 16The GPERschool relates the total number of children enrolled in the schools in a geographical area regardless of their place of residence, to the number of children residing in this area. It allows an estimation of the extent of educational activity in the area considered. 17The GPERchild relates the number of children residing in an area who are enrolled in pre-primary education – be it in Brussels, Flanders or Wallonia – to the total number of children residing in the area considered. It allows an estimation of pre-school attendance among the population residing in a specific area. 18The gross pre-primary enrolment rate according to the municipality of the school (GPERschool) (Table 2) is 106 at regional level. It indicates that the pre-school activity developed by the region exceeds the official population of children. This rate has increased slightly since population growth began, rising from 103 in 1995‑96 (HUMBLET, 1999). 19To be exact, the numerator must be adjusted in order to consider children enrolled in private and international schools: the 2008‑09 regional GPERschool was therefore 109 (Table 2). The denominator must also be adjusted to consider illegal resident children. We do not know the number or the place of residence of these children and we must rely on estimates. The GPERschool would therefore be 99 based on the observation that approximately 1500 illegal births take place annually (which would represent 5 250 children aged 2 ½ to 5), without counting the children born abroad and who are illegal residents. Although it is very imprecise, this estimate underlines the fact that it is important to have more accurate data in order to confirm actual enrolment rates. 21The inter-municipal differences are significant, ranging from a minimum of 78 in Saint–Gilles and Schaerbeek to 184 (or 199 with the children from private and international schools) in Woluwe-Saint-Lambert (Table 2). For example, for Schaerbeek, this means that the school population of kindergartens on its territory corresponds to 78% of the number of children aged 2 ½ to 5 residing in the municipality. The opposite is true in Woluwe-Saint-Lambert, which provides education to twice the number of children who reside there. 22With the population growth, the municipal figures have not changed fundamentally. Between 1995‑96 and 2007‑08, a slight decrease in the GPERschool occurred in 6 municipalities (ranging from 2% to 12%), whereas an increase was observed in 13 municipalities (ranging from 1% to 14%, with an exceptional figure of 34% in Saint-Gilles), thus indicating an intensification of educational activity in these municipalities (HUMBLET, 2010). Although the vast majority of municipalities in Brussels have always had a GPERschool higher than 100, some of them have always had lower values (at least since 1991‑92), such as Molenbeek, Saint-Gilles, Saint-Josse and Schaerbeek. The latter are known to be home to a large number of children who reside there illegally. 23The second indicator is that of the gross pre-primary enrolment rate according to the child’s municipality of residence (GPERchild). At Brussels regional level (Table 3), 96.9% of children aged 2 ½ to under 6 are enrolled in a kindergarten, regardless of the location. The rate decreased by 1.2 between 2004‑05 and 2007‑08. The period of comparison is rather short due to the fact that the data regarding the place of residence of children have only been available for a few years (via ETNIC and the VGC) (HUMBLET, 2010). 24Adjustments of the numerator and the denominator are technically impossible here: as regards the numerator, we have not received the place of residence of children enrolled in private and international schools, and with respect to the denominator, we know neither the number nor the place of residence of illegal resident children. These adjustments would probably have the effect of increasing the GPERchild in the well-to-do municipalities where a lot of private and international school pupils and few illegal resident children live. However, the addition of the number of illegal resident children to the denominator should decrease the GPERchild of certain municipalities such as Anderlecht, Saint–Josse and Schaerbeek. 25The interpretation of the pre-primary enrolment rate GPERchild reveals the educational practices of the population. In all municipalities, more than 90% of children aged 2 ½ to under 6 go to kindergarten, regardless of the location. In well-to-do municipalities, these rates are lower than the average regional figures, whereas they are close to or higher than 100% in municipalities such as Anderlecht, Molenbeek, Saint–Josse and Schaerbeek. 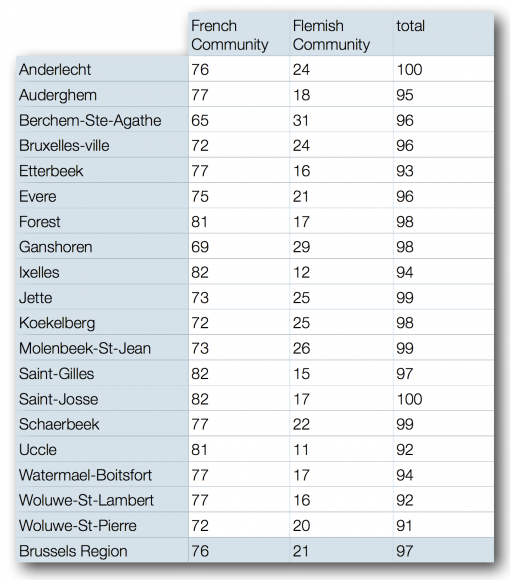 26Several municipalities – Molenbeek, Saint-Gilles, Saint–Josse and Schaerbeek – have a GPERschool which is lower than 100 (Table 2). The two indicators of pre-primary school enrolment thus highlight spatial inadequacy between supply and demand. This could represent an obstacle if new provisions were to hinder intermunicipal mobility. The effect would be felt in municipalities where the current availability is lower than the number of resident children, and where there is a maximum demand for pre-school education which turns to neighbouring municipalities. 27The analysis of the increase in the number of pupils and pre-primary enrolment rates lead one to believe that the education market is adapted to population growth and that, overall, it meets the demand at the expense of considerable travel on a daily basis. However, it does not provide an answer to our initial questions regarding the relationship between population growth and availability in terms of equal access to school. Without a regional system to coordinate enrolment requests, we have conducted a qualitative survey at local level which allows a better understanding of the possible lack of availability, by introducing the perspective of social equity. An exploratory qualitative survey was conducted in June and July 2010 in eight municipalities chosen according to their size and the values of pre-primary enrolment indicators: Anderlecht, Brussels City, Forest, Jette, Molenbeek, Schaerbeek, Saint-Gilles and Uccle. As the organisation of school systems and family practices do not comply with a strictly municipal logic, the objectives were to identify the outlines of the problem at local level and to carry out an analysis by taking the regional level into account. This survey favoured the stakeholders with decision-making power for an area or a municipality in the French-language system.4 Only two stakeholders in the Dutch-language system were identified due to the regional centralisation of enrolments and the publication of a study which took a close look at the question (JANSSENS, 2009). A discussion group was held with six mothers who were living in one of the municipalities with a general lack of availability and who brought their children under age six to a nursery. Our aim was to identify some enrolment patterns to illustrate our analyses. 28For the participants in the study, many schools are said to be “saturated”. It appears that a saturated school is one in which all of the classes are full and in which it is no longer possible to open new classes. The saturated schools in 2009‑2010 are often schools which have undergone changes in the past in order to meet a growing demand, and whose buildings are no longer able to be extended. The changes already made often affect the teaching quality: the spaces necessary for the children’s well-being (toilets or dining halls) and for different educational situations (playtime, psychomotricity, naps, etc.) have disappeared. Elsewhere, the standard for primary school has been applied to kindergarten, i.e. 24 pupils per class, or children from two classes and their teachers share a single space. This is how welcoming classes for children aged 2 ½ often reach unacceptable sizes of 30 to 35 children at the end of the year. 29Saturation concerns above all the welcoming classes and kindergarten. This is the result of a shortage of space. The maximum capacity must not only take into account the “classrooms” but also the additional spaces (dining halls, playgrounds, toilets, etc.) necessary in order to maintain the quality of education and the wellbeing of children. The people responsible who were interviewed underlined that it is also necessary to maintain a balance between the different levels in the medium term. If all of the free spaces are taken by new kindergarten classes, there will no longer be any space for these children once they reach primary level. 30Janssens (2009) observes that all of the kindergartens in the Flemish Community schools experience considerable saturation problems. The opinion of headmasters is gathered based on a subjective perception of the physical space and on teaching and social aspects. The effects of population growth are also felt, especially for the first year of pre-primary education, in certain municipalities in particular. 31The geographical concentration of saturated schools defines areas where there is a shortage. Janssens’ study (2009) defines categories of municipalities according to their level of shortage in their Dutch-language schools. These results indicate an average occupancy rate of 98.6%. In our survey, four out of eight municipalities in the survey are considered to be municipalities with a generalised shortage, i.e. where all of the schools are saturated. The phenomenon began there at the end of the 1990s with the “much sought-after” schools, and for the past two or three years has spread to other “less sought-after” schools. This situation is experienced as a major crisis and enrolment is no longer possible at Easter or even at the end of January. In one municipality, the waiting lists were full before the summer holidays of the previous academic year. In a second group of municipalities, the shortage is considered to be a short- or medium-term situation. The waiting lists have been full for a long time for the “much sought-after” schools, and those which usually had room during the year are often full before the beginning of the summer holidays. 32Everything seems to confirm that entire municipalities or neighbourhoods are saturated in the region. Their geographical scope has the effect of moving the problem to areas where the local situation is different, but where a defensive approach is used and justifies measures for enrolment regulation. Inventories of available and unoccupied space have been carried out or are under way, and the construction of new schools is being considered. However, given the usual construction deadlines, these new schools will not be ready for the children who must be enrolled today, but rather for the following groups of children, whereas the educational pathway of children today will be permanently marked by the saturation of the system. 33The French-language and Dutch-language education systems have developed enrolment procedures whose main objective is to thwart the social segregation trend at school level, and thus overcome the lack of equity in education system results (MAROY, 2007; DELVAUX, 2009; CANTILLON, 2009). For education organised by the French Community, the “missions” decree (1997) only concerns enrolment in the first year of secondary education. For education organised by the Flemish Community, in the decree of September 2002, Gelijke onderwijskansen (GOK), there is a similar concern to respect the choice of parents and to ensure social mix as well as a certain transparency in the procedures. All pupils are concerned, beginning with basic education. Local coordination platforms (lokale overlegplatforms) have been created since 2006, including one for the Brussels Region (LOP Brussel) since June 2009. 34The survey shows that in the French Community education system, there is a strong tendency to regulate kindergarten enrolment at local level, in municipalities with a generalised shortage or elsewhere. At the time of the survey, three out of eight municipalities had recently elaborated a new regulation in the French-language schools in their network, and three others had plans to do so for September 2011. This involved above all municipalities in which the crisis is acute, but not exclusively. This is the reason why the implementation of a regulation is not a reliable indication of a local lack of availability. 35The formal regulations provide for various methods. Enrolment takes place at school or municipality level, only during the preceding year and during various periods. In Dutch-language education, the system is centralised via a platform. A “pre-enrolment” period in a minimum of five schools precedes the final enrolment period in the school designated by the system. 36Overall, the regulations are based essentially on three criteria to determine the children with priority: age, siblings and place of residence. Legally, children may be enrolled at age 2 ½ – a criterion which usually requires the child to be “clean” when he or she actually starts attending school. In two municipalities, the new regulation moves de facto the age to 3 and up, either by specifying the authorised months of birth, or by a system which grants priority to the oldest children. Siblings have priority. This criterion is part of the formal regulations as well as existing informally in their absence. However, it tends to be restricted in the case of a family’s change of residence. The introduction of the sibling criterion is sometimes enough to saturate the first year of kindergarten or the welcoming class, as internal recruitment is significant when there is a high number of primary school classes. The place of residence is the third criterion to exist explicitly or implicitly. It takes into consideration either the neighbourhood of the school independent of the municipality, or the municipality independent of the neighbourhood. In certain cases, a quota of children who live outside the municipality is set beforehand. In others, the regulations create two lists, with the one for children residing outside the municipality being considered last. 37Finally, there are two criteria which are specific to Flemish Community education: a social criterion (30% of places for children whose mother does not have a secondary school diploma, the beneficiaries of a scholarship, travelling people or foster children) and a linguistic criterion aimed at ensuring that a minimum proportion of pupils (45%) are Dutch speaking before being provided with schooling. With the exception of one municipality, none of the people responsible at municipal level wish to stop the enrolment of children from other municipalities or from the outskirts of Brussels, and even less so in the “much sought-after” schools. 38Therefore, in order to be able to enrol a child who has reached age 2 ½, parents must juggle with the characteristics of their request and do it at different moments during the year according to the school of their choice. The priority criteria vary according to the education system of the French Community or the Vlaamse Gemeeschap, the municipality of residence, the location of the chosen school with respect to their place of residence, family make-up and – for the Dutch-language system – the social and linguistic characteristics of the family. Before the age of 3, the young age of the child may represent an obstacle in French-language education in some municipalities. However, enrolment at age 2 ½ is encouraged in Dutch-language education. The risk of not being part of the population targeted by the school is probably difficult for families to define; and the risk of being sent from one school to another for different reasons is even greater in municipalities where there is a severe shortage. As mentioned earlier, the municipalities of Molenbeek, Saint-Gilles, Saint–Josse and Schaerbeek in particular have a high population of children who do not speak French or Dutch at home. 39The waiting lists contain all of the errors of this type of procedure. They may be centralised or established at school level, which is the case most of the time. Their elaboration methods are determined by regulations when they exist, otherwise they are elaborated without restrictions. In this case, there are lists with waiting periods of more than three years, lists of births of a brother or a sister, etc. The waiting lists themselves may be closed once they are considered to be too long, therefore no longer recording any unsatisfied requests. They rarely lead to a follow-up and, if they do, it only concerns children who live in the municipality, for whom the municipal authorities consider themselves to be responsible. There is no mechanism to define and monitor this issue as a whole at regional level. 40The demand for pre-school education beginning at age 2 ½ is widespread among the population of Brussels. Is it met fairly? Due to demographic pressure, all of the ingredients for socially unfair access and use of kindergarten exist in Brussels. The equity of use is based on individual and contextual factors whose negative impact on socially disadvantaged groups becomes greater when there is a lack of availability. At family level, it is necessary to have access to adequate information, to have a good capacity to anticipate and to make plans, and to have a stable family situation and place of residence, as everything is decided during the year which precedes the first day of school. Furthermore, a familiarisation with the education system and with the administrations and a sufficient knowledge of French or Dutch are also important factors in order for a request to have a favourable outcome, but these characteristics are not distributed randomly in social groups. Context also plays a role. The different selection factors for enrolment do not only exist in the geographical areas with shortages, but also in those where the lack of availability is not yet established, thus generalising the risk of inequality even where demographic pressure is not severe. 41A particular point should be underlined regarding the tendency to increase the age of entry to kindergarten to age 3 and up. This has many consequences for community facilities as well as for families. The children who free up space in nurseries from the age of 2 ½ remain in them longer because they are rarely authorised to begin kindergarten. This delay leads to added expenses for families which have to cover the cost of nurseries for a greater length of time (at least 10% of the household budget), whereas school is free. It also affects the children from families in which the parents are unemployed, i.e. one out of four children in Brussels. They are unable to benefit from the educational advantages of nurseries as well as from the advice of the professionals who work in nurseries in order to enrol their children at the desired moment in a school of their choice. And let us not forget the mothers who wait until their child begins school in order to enter the job market again. This delay also threatens the efforts made in recent years by the “Plan crèche” to increase child care coverage in the Brussels Region. Federal Planning Bureau (May 2008) Perspectives de population 2007‑2060. Direction générale Statistique et Information économique, Brussels. CANTILLON, E. (2009), “Regulating School Choice in Brussels”, Brussels Studies No. 32. http://brussels.revues.org (consulted on: 19 Jully 2011). DELVAUX, B., MAROY, C. (2009), “Débat sur la régulation des inscriptions scolaires en Belgique francophone : où se situent les désaccords ?”, Les cahiers de recherche en éducation et formation, No. 68. DELVAUX B., BOUCHAT, T.M., HINDRYCKX G. (2008), Espace local et choix du lieu de scolarisation dans l’enseignement fondamental. Le cas de trois espaces locaux urbains en Communauté française de Belgique. Les cahiers de recherche en éducation et formation, No. 64, August 2008. DUSART, A. F., MOTTINT, J. (2007), Les conditions d’enfance en région de Bruxelles-Capitale. Indicateurs relatifs aux enfants et aux familles. Bruxelles, CERE, asbl, Observatoire de l’enfant. EURYDICE, (2009). National summary sheets on education systems in Europe and ongoing reforms 2009 Edition. HUMBLET, P. (1999), Indicateurs de l’accueil et de la garde de jeunes enfants en région bruxelloise 1996‑7. Rapport Observatoire de l’enfant, No. 15/99. HUMBLET, P. (2010), Accès pour tous à l’école maternelle dans la Région de Bruxelles-Capitale. Effets de la croissance démographique récente sur l’entrée à l’école maternelle. Rapport de l’Observatoire de l’enfant, October 2010, 49 pp. HUMBLET, P., VAN CUTSEM, S. (2002), “Y a-t-il une géographie de la scolarisation et de l’utilisation des garderies scolaires de l’enseignement fondamental ? Des réponses pour la région bruxelloise.” Grandir à Bruxelles. Cahiers de l’Observatoire de l’Enfant, No. 10, pp. 13‑17. HUSTON, A. C., CHANG, Y. E., & GENNETIAN, L. (2002), “Family and individual predictors of child care use by low-income families in different policy contexts”, Early Childhood Research Quarterly, vol. 17, pp. 441‑469. IBSA (June 2010) Impact de l’essor démographique sur la population scolaire en Région bruxelloise. Les cahiers de l’IBSA, No. 2. JANSSENS, R. (2008), “L’usage des langues à Bruxelles et la place du néerlandais. Quelques constatations récentes” Brussels studies. No. 13, 7 January 2008. http://brussels.revues.org (consulted on: 19 Jully 2011). JANSSENS, R. (2009), Onderzoek naar de capaciteit van het Nederlandstalig basisonderwijs in het Brussels Hoofdstedelijk Gewest. Onderzoekverslag, BRIO, 2009, p. 19. ANSSENS, R, CARLIER, D., VAN DE CRAEN, P. (2009), “Etats généraux de Bruxelles. Note de synthèse No. 5. L’enseignement à Bruxelles”, Brussels Studies. http://brussels.revues.org (consulted on: 19 Jully 2011). “La démographie invite à construire”, Prof, March 2010. LORANT, V. (1996a), “Du taux de couverture à l’établissement”, Grandir à Bruxelles, No. 2, 1996, pp. 14‑16. LORANT, V. (1996b), “La crèche est-elle un instrument de ségrégation ?” Grandir à Bruxelles, No. 2, 1996, pp. 17‑18. MAHIEU, R. (2005), “Les modes d’accueil des enfants de moins de trois ans : effets d’offre et de demande”, Recherches et Prévisions, Vol. 82, pp. 43‑55. MAROY, C. (2007), “Pourquoi et comment réguler le marché scolaire ?”, Les cahiers de recherche en éducation et formation, No. 55. Observatoire de la santé et du social Bruxelles OSSB (2010). Tableau de bord de la santé en Région bruxelloise 2010. Pauvreté et école, quelles priorités ? Manifesto http://www.dgde.cfwb.be/index.php?id=3043 (consulted on: 19 Jully 2011). UNICEF Innocenti Research Centre, (2008) La transition en cours dans la garde et l’éducation de l’enfant. Tableau de classement des services de garde et d’éducation des jeunes enfants dans les pays économiquement avancés. Innocenti Report No. 8. VANDENBROECK, M. et al. (2008), “Mothers’ search for infant child care: The dynamic relationship between availability and desirability in a continental European welfare state”, Early Childhood Research Quarterly, No. 23, pp. 245‑258. 2 The date for counting the number of pupils enrolled was changed to 15 January by the French Community during the 2003‑04 school year. Since this date, the number of pupils enrolled has increased as it takes into consideration the children who begin during the first half of the year, especially in the welcoming class and in the first year of kindergarten. 3 Age group: access to kindergarten begins at age 2 ½ if the child meets certain developmental criteria established by the schools (mainly regarding sphincter control). In this article, the GPER is calculated based on the past population of children aged 2 ½ to 5. The population aged 2 ½ to under 3 is estimated by halving the National Registry population of children aged 2 to under 3. 4 The people interviewed belonged to the following categories: Anderlecht, Jette, Forest, Uccle, Schaerbeek, Saint-Gilles; educational services, mayor’s cabinet, inspector: Anderlecht, Boitsfort, Bruxelles-Ville, Jette, Molenbeek, Schaerbeek, Schaerbeek, Saint-Gilles; school management: Forest; Associations: Jette (F & Nl), Anderlecht; Parents: Anderlecht (group of 6). Perrine Humblet is a doctor of public health science and a teacher at Public Ecole de Santé Publique, Université libre de Bruxelles. She works on early childhood policies and programmes, as well as on the social determining factors of health. She is expert for the Observatoire de l’Enfant de la Région bruxelloise and for international organisations (European Commission Childcare Network, OECD and UNESCO). She recently published: Meulders D, Humblet P, Maron L, & Amerijckx G (2010). Politiques publiques pour promouvoir l’emploi des parents et l’inclusion sociale. Bruxelles: Politique scientifique fédérale, Série Société et avenir, Academia Press.